1 What is SophiaCompress(Java) OASIS? 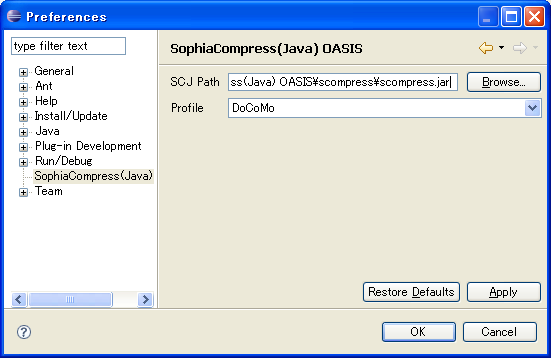 SophiaCompress(Java) OASIS is a compression tool for mobile Java applications with MIDP or Star / DoJa profile, that minimizes the size of a JAR file. 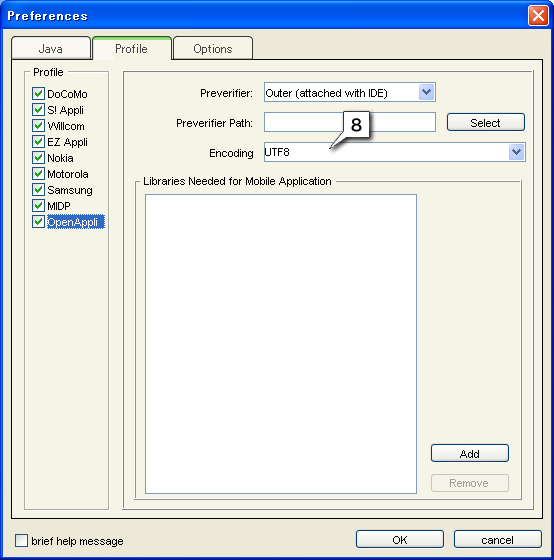 The J2ME Wireless Toolkit version 1.0.1 preverifier is not supported by SophiaCompress(Java) OASIS. To install, double-click the installer icon. An InstallShield wizard will take over to guide you through the installation. SophiaCompress(Java) OASIS is booted up, using one of the 3 following methods. Double-clicking on the SophiaCompress(Java) OASIS icon. Double-clicking scompress.jar inside the installed folder. If [Java SDK] is empty, set up the JAVA_HOME path where Java SDK is installed using the [select] button. The JAVA_HOME path can be set up by selecting the path of bin\java.exe in the Java SDK, for example C:\j2sdk1.4.2_08\bin\java.exe. The supported version of Java SDK is 1.3.1 or 1.4.2. Setting up the Compression Tool. Select the [ZIP path] of the compression tool, and set up its [ZIP parameters]. Enter %1 as the input folder, and %2 as the output file. * If [7-ZIP] or [kzip] is selected, [ZIP Parameters] are automatically set up as follows. * [Profile]: Only profiles that have been checked are included in the profile list of the main window. [Preverifier Path] is valid when the Outer option is selected. The preverifier attached to the mobile Java SDK should be selected. Listing Class Libraries Referred to by the Application. A library can be added to the list of [Libraries Needed for Mobile Compression] with the [Add] button. A library can be removed from the list of [Libraries Needed for Mobile Compression] with the [Remove] button. * In general, class libraries are in the /lib folder of the mobile Java SDK. *NOTICE : In case of NTT DoCoMo Star / DoJa, dbgclasses.zip in the /lib folder is a library for debugging and it must not be added. A KJX file is generated when [Create KJX File] is checked, and a [KJX Maker] path is selected. CRC information is added to the compressed application when [Add CRC] checked and the path of a [CRC Maker] is selected. By default, ASCII encoding is selected to read / write the JAD file. Other types of encoding can be selected from the list of [Encoding], or the type's Canonical Name can be directly entered in the [Encoding] field. However, since the JAD file of KDDI's OpenAppli must be specified in UTF8, there is only UTF8 in the [Encoding] field. * If [Shorten Class Names] is checked, a new main class name may be entered in [New Main Class Name] and saved with the [Change] button. * The [Class Integration] or [Optimize Stack Map] ( Make New Class ) options may increase the compressed application's memory consumption during execution. If OutOfMemoryError occurs, [Integration Level] should be lowered, or both these options turned off. The [Import] button is used to select an application file in JAR or a folder containing many JAR files for compression. A file / folder can also be selected by Drag & Drop. *NOTICE : The jar file for "Full+Mini Appli" and "Mini + Full Appli" of NTT DoCoMo Star Profile is not supported. To compress it, specify the jar file for "Full Appli" or "Mini Appli" separately. The application Profile should be selected in the lower left corner [Combobox]. Compression starts the [Compress] button is clicked. Detailed compression information is displayed when the [View log] button is pressed. : Compression was completed without errors. : Compression finished but a preverifier error occurred. : An error occurred during compression. When the [Brief Help Panel] is enabled from [Help] menu, help information on UI components is displayed as the mouse cursor moves over them. The following parameters are automatically set up in the Configuration Files created when using the GUI edition of SophiaCompress(Java) OASIS, but they can also be manually specified. * Only [-version] should be specified. * A NULL string should be specified as CRC maker. 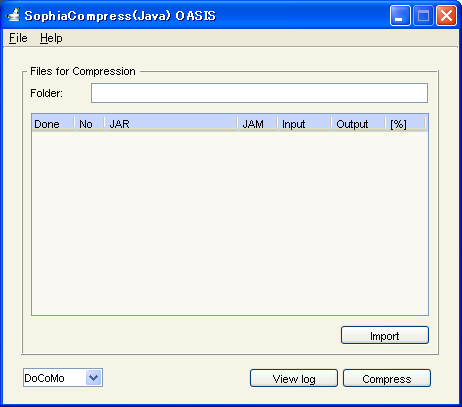 Configuration Files are .cfg text files in the same folder as scompress.jar generated when the GUI edition of SophiaCompress(Java) OASIS is used for the first time. if this flag is set to true, the SDK preverifier specified in PREVERIFIER_FILE_PATH is used. If false, preverifier of SophiaCompress(Java) OASIS is used. * The parameters except INTEGRATION_RATIO and NEW_CLASS_NAME are set up by true or false. * A compression method is enabled / disabled by entering either true / false. When the CUI boots up, a configuration file reads the cfg file of the current folder. If it is not found in the current folder, a cfg file is read from the folder containing scompress.jar. A cfg file is not read if not found in these two folders. Install the Eclipse plug-in with the SophiaCompress(Java) OASIS installer. * The plug-in can also be installed by copying the com.s_cradle.sophiacompress.eclipse.plugin_1.0.0.jar file into the plugins folder of Eclipse. To set up the plug-in path, select the Eclipse menu [Window] - [Preferences...]. At [SCJ Path], the file scompress/scompress.jar is set up in the SophiaCompress(Java) OASIS folder. The Profile of the applications that will be compressed is selected in [Profile]. 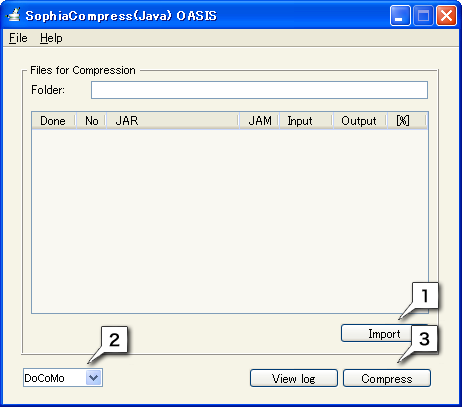 SophiaCompress(Java) OASIS preferences, must be set prior to compression. Right-clicking a Java project in the [Package Explorer] window of Eclipse chooses it. Selecting [Compress] from the menu, starts the compression of the JAR file and the ADF file in the bin or deployed folder of the project. A shortage of heap memory for the Java system leads to compression failure. The Java heap memory size may be increased by booting up SophiaCompress(Java) OASIS with the option -Xmx<size>. The actual size of the heap is specified in <size>. * This boot up option is entered as -Xmx100m, and not -Xmx<100m>. A shortage of stack memory for the Java system leads to compression failure. The Java stack memory size may be increased by booting up SophiaCompress(Java) OASIS with the option -Xss<size>. The actual size of the stack is specified in <size>. * This boot up option is entered as -Xss50m, and not -Xss<50m>. SophiaCompress(Java) OASIS may not operate correctly if double-byte characters ( e.g. Kanji ) are used in the absolute path of a JAR file to be compressed. An application that uses a Class.forName method, may not function correctly after compression. When the application refers to class names that are dynamically made by String operations. When the class name appears as a string, on the screen of the mobile phone. The Class Integration and Optimize StackMap ( Make New Class ) methods may increase the memory consumption of the application after compression, make it terminate during execution with an OutOfMemoryError, and may also cause the Garbage Collector to run more frequently, slowing down the application. Integration Level should be lowered or the Class Integration and Optimize StackMap methods should be turned off. 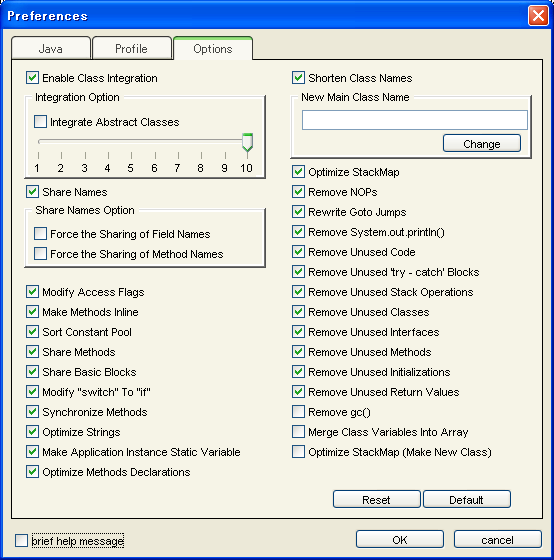 The Class Integration and Shorten Class Names methods may change absolute class paths. If resource files are accessed through relative class paths, the compressed application may fail to access them. Resource files should be accessed through their absolute paths. SophiaCompress(Java) OASIS cannot handle picture characters encoded with SJIS_i. The SJIS_i18n.jar file of JDK is modified to handle the SJIS_i encoding as follows. i18n.jar will exist in one of the following paths. Unpack the i18n.jar file onto the i18n folder. Replace the i18n folder with the i18n folder in the %IDK_HOME%/lib folder. Compress the i18n folder and name it i18n.jar. Replace the i18n.jar file in the original folder with the i18n.jar file in the Step 4. * %JAVA_HOME% is the folder where JDK was installed and %IDK_HOME% is the folder where the i-Appli development kit was installed. When the window size is too small to use, SophiaCompress(Java) OASIS may be booted up with the -resize option specified. Delete attributes added by the preverifier such as Synthetic, InnerClass, Deprecated, StackMap, which are irrelevant to program execution. Delete the fields irrelevant to program execution. Delete the methods irrelevant to program execution. Delete the classes irrelevant to program execution. Delete the return values that are irrelevant to program execution and make the return type of the method void. Delete the initialization codes of fields and arrays that are irrelevant to program execution. Share and abbreviate the class field names. Share and abbreviate the method names. Sort the entries in the constant pool for efficiency of the ZIP compression. Merge the class variables into an array. Share and abbreviate the class names. Delete the unused codes (dead codes). Delete the unnecessary try - catch exception tables. Delete the goto instructions that will jump into next instruction, and rewrite the target of the goto instruction that will jump on another goto instruction. Delete the System.out.print and System.out.println instructions. Change the order of the local variables so that the local variables frequently referred to may be moved into the beginning position of the array for variables. Delete unnecessary codes that will push a value onto stack and pop it up without referring to. 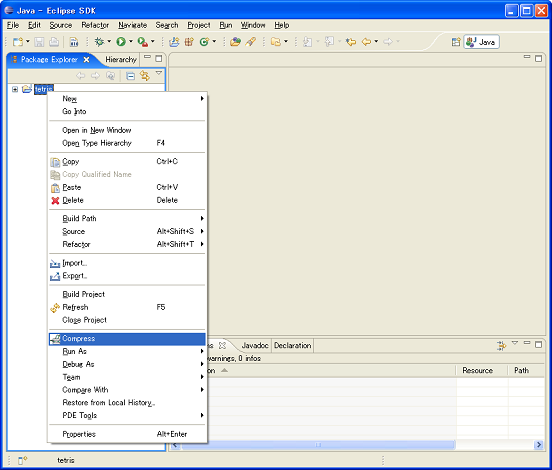 Expand and delete the methods that are small or called at the only one position. Modify the access flags of the classes, methods and fields for the efficiency of the ZIP compression. Replace the switch instruction with less than two branches with the if instruction. Share the methods with the same codes. Make the new synchronized methods from the synchronized statements. Replace strings that are made in programs dynamicaly with constant strings if they are able to be calculated. Change instance methods into static methods if possible. Change instance fields of application class into class fields. Support the JDK 1.4 so that an application made with JDK 1.4 may be compressed. Two classes can be integrated into one class under some conditions, this process is repeated with other classes recursively. Optimze StackMap : Delete StackMap attributes appended when preverifying. Optimze StackMap ( Make New Class ) : Delete StackMap attributes appended when preverifying, and make new classes instead. Share Basic Blocks : Share the Basic Block between the Basic Blocks with no jump instructions. If any questions, comments, suggestions, or anything else related with SophiaCompress(Java) OASIS, contact us through our Question Form. And if a bug is found, please contact us with error information, its compression logs, screen captures, etc. 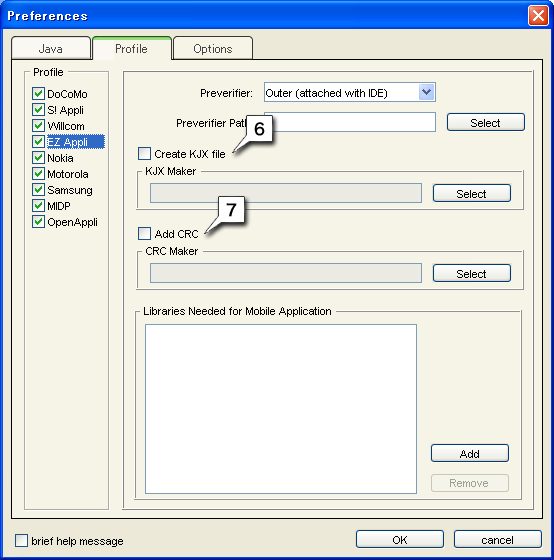 a file that contains the important information on mobile Java application such as application name and size, JAR file location, date of last modification, etc. In Star / DoJa, it is called JAM file, and in MIDP it is the JAD file. verifying the program for use before running on the mobile handset. An error will occur if the application executed on the handset without preverifying. In general, IDE always preverifies the application after compilation. program for preverifying applications, usually in the /lib folder in JDK. JAR or ZIP file including classes necessary for the application execution. Some libraries are provided with the JDK, and almost all the mobile carriers and phone makers also provide their own specific class libraries usually in the /lib folder of IDE. for mobile operators (Star / DoJa, V-appli, Willcom and EZ Appli), for mobile phone producers (Nokia, Motorola, Samsung) and universal MIDP - we use the term 'mobile profiles' to represent all of those types together. the attribute name of the instructions in the Java class file added when preverifying. Java and trademarks related to Java are trademark and registered trademark of Sun Microsystems, Inc. in the United States of America and other countries. Names of companies and products are trademarks and registered trademarks of each each respective organization.